After studying ancient minerals in a meteorite, MIT scientists have gained valuable insights that help explain how the sun, the planets and our entire solar system formed.Their work suggest that a powerful shock wave that rippled through the clouds of dust and gas surrounding the sun billions of years ago played a crucial role in clumping matter, which later formed into planets, moons and asteroids. Though there are numerous planetary formation theories proposed for our solar system, scientists have yet to reach a definite consensus. By observing other solar systems, astronomers believe it usually takes some five million years for a star’s planets to form from the huge accretion disk of matter the surrounds the star, bounded by gravity. For this to happen, there needs to be a very efficient accretion mechanism that can’t be explained by gravity alone. Magnetism and other forces have been proposed by various models, yet there’s been no way to prove these until now. Remember, we need evidence that survived the 4.5 billion years since our solar system formed, and this is no easy task. The key might lie in olivine-bearing chondrules – large grains of molted droplets. These chondrules were studied by the MIT team, led by graduate student Roger Fu, from chondrite meteorites, which are pieces of asteroids broken off by collisions. The chondrite analyzed by the researchers is called Semarkona, after the place in India where it fell in 1940. It weighed 691 grams, or about a pound and a half. We first need to understand how these chondrules came into existence in order to realize the significance of this study. In its early days, the sun was surrounded by a solar nebula – a a revolving patch of gas and dust. Some of this matter became heated past its melting point and the dustballs turned into droplets of molten rock, only to later cool and crystallize into chondrules. Yet, as the chondrules cooled, iron minerals inside became magnetized and these magnetic fields remain preserved to this very day as they have been for the past 4.5 billion years. And this is precisely what helped the MIT researchers in their breakthrough. 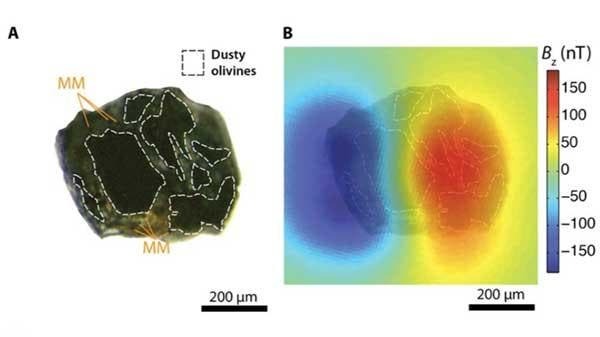 The researchers found that the chondrules had a magnetic field of about 54 microtesla, similar to the magnetic field at Earth’s surface, which ranges from 25 to 65 microtesla. The new analysis suggests that the minerals became magnetized well before they joined together to form the meteorite. 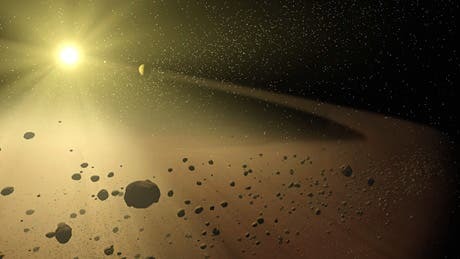 The researchers gather, after modeling the heating event that melted dust into chondrules, that an intense shock wave passing through the solar nebula is what triggered the event and magnetized the minerals. Depending on the strength and size of the shock wave, the background magnetic field could be amplified by up to 30 times. “Given the measured magnetic field strength of about 54 microtesla, this shows the background field in the nebula was probably in the range of 5 to 50 microtesla,” Desch says. According to Fu and colleagues, the registered magnetic field must have been strong enough to affect the motion of a huge amount of gas at a large scale, in a significant way. 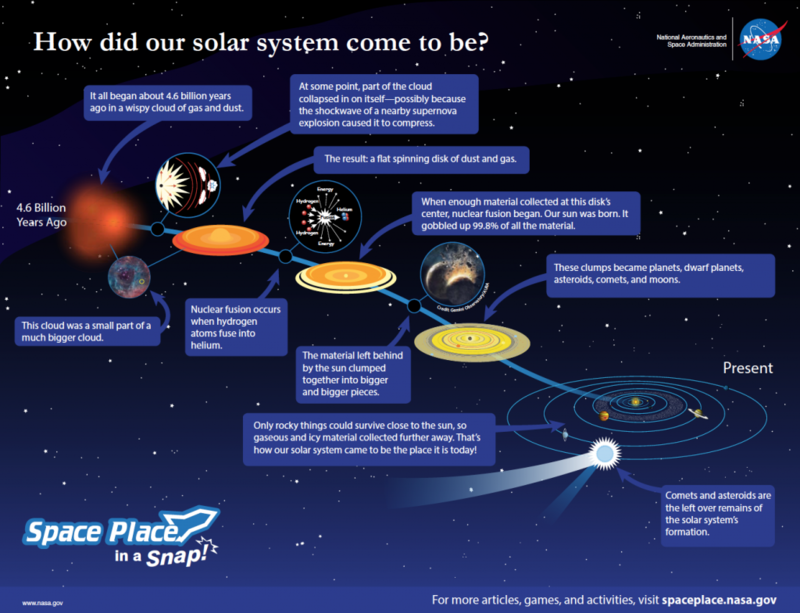 Most importantly, the findings provide important evidence that supports the idea that our solar system was shaped by both magnetic and gravitational forces.